I bought the 2002 edition with the rather bland cover art. The story was anything but bland and I went on to read every novel and short story in the Liaden Universe to my great pleasure. Love the cover on the 2018 edition! I have, or shorty will have when B & N sends me the 30th anniversary edition, all the books. The first cover still grabs my attention as it did when I bought it on first publication in 1988. The story rocked and I eagerly bought the next two books. But it was that cover that kept prodding me to look for more Liaden stories. Turtles Rule! 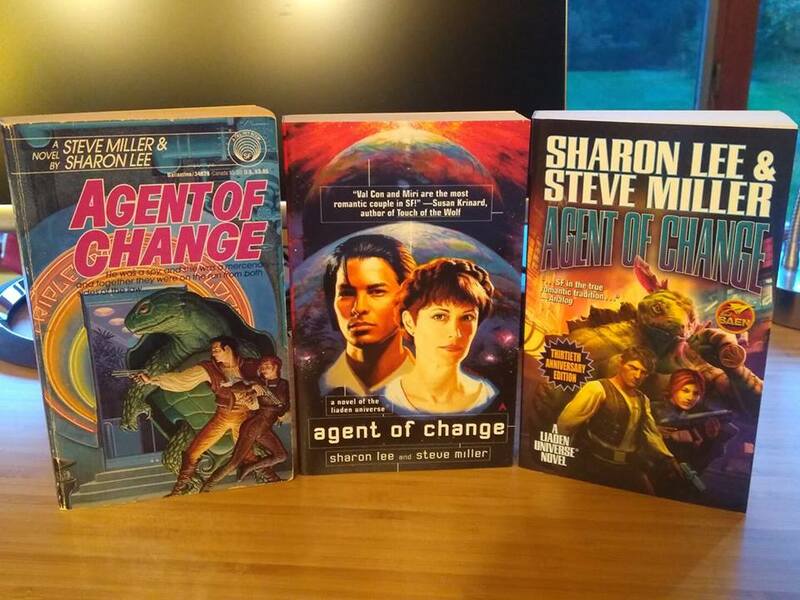 I have the 2002 edition, and at least 3 e-copies (one bought on purpose, the others included in a Baen monthly package) I don’t have many of your books as…well books. It was perhaps a year or so after that 2002 edition, when I stopped being able to trust even a paperback in my hands. So now, I read on my phone when my hands are good, and on my PC screen when they are not. Yes, I will get the anniversary edition e-book, and I will read it, too. Your books make excellent re-reading fodder! I was introduced to Liad via the Baen Free Library in December 2013 when I was 50 years old. Since then I have read almost everything you and Steve have written. (I’ve yet to read The Tomorrow Log) I eagerly await the next entry and hope to continue getting my fill in the years to come. Reading your books takes me back to the time I was I teenager reading Heinlein, Asimov, Niven, Pournelle, et.al. 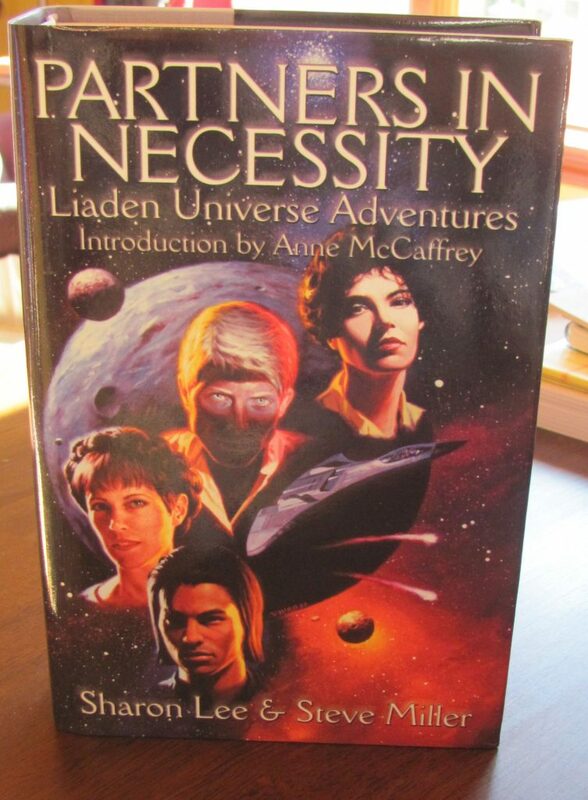 I first found the Liaden Universe via Baen’s Free Library (Agent of Change I believe). Have since gone on to get most of the rest as e-books or e-arcs (for all the newest ones as can’t wait until the final edition comes out!). In looking at these covers from the earlier editions I am most shocked by the one for “Partners”. Although cover depictions almost never match one’s own visualization of a character that one just seems really off. Not so much the portraits (although Val Con just does not seem right) but the lighting style that was used. If one did not know the characters you would think that Shan and Val Con were the villains of the story while Miri and Priscilla were the heroines due to how the males are in shadows while the females are well lit. Shan in particular looks very villainous and almost skeletal. The newest covers are much more pleasing although the one for “Korval’s Game” long puzzled me until it dawned on me that it shows Shan and Miri in front of the downed shuttle from “I Dare”. Look forward to reading “Accepting the Lance” and the other stories once they’re finally ready. I have the original edition, & love the Hickman cover.